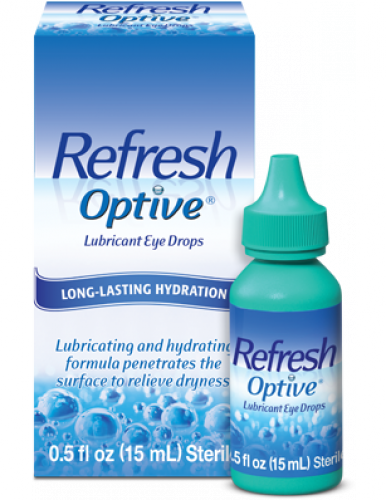 REFRESH OPTIVE® contains not just one, but two active ingredients that help relieve dry, burning, irritated eyes due to Dry Eye. This specially designed formula provides long-lasting moisture that hydrates and protects the cells of the eye that can become damaged due to Dry Eye. Safe to use as often as needed. Also available in a preservative-free formula. Dry Eye symptoms are a common complaint among people visiting an eye doctor. If solution changes color or becomes cloudy, do not use. Stop use and ask a doctor if you experience eye pain, changes in vision, continued redness or irritation of the eye, or if the condition worsens or persists for more than 72 hours.